Oklahoma should enact a new program that empowers special-needs students to attend the school of their choice, the Friedman Foundation and OCPA said today. A study released by the two organizations found that the state and also local school districts could save tax dollars under the proposed program. Mike Antonucci reminds us what a union is all about. Sara Plummer reports in today's Tulsa World that some private schools "have raised tuition and are helping parents deal with costs." "It should be obvious to everyone," the nation's largest newspaper editorialized today, "and certainly to every parent, that only the most extreme circumstances could justify strip-searching a 13-year-old girl. More extreme, surely, than suspicion that the girl possessed some prescription-strength ibuprofen tablets in violation of school rules." One can't help but think from the story formula that even this AP reporter recognizes that the tenacity, ingenuity, and perseverance of many homeschool families is emblematic of what makes America great. Are charter schools the future of public education? Nope, it's the other way around, Andrew Coulson argues. UPDATE: Mike Antonucci is more sanguine about the future of charters. This anti-capitalist video "has become a sleeper hit in classrooms across the nation," The New York Times reports. The next president of the Oklahoma Education Association, Becky Felts, was profiled yesterday in the state's largest newspaper. For someone who went out of her way to emphasize her roles as a small-town mother, grandmother, elementary school teacher, and (best of all!) Sunday School teacher, mee-maw was probably less than thrilled that the first two words in the article's headline were union boss. "I love the classroom. I love teaching children. I miss doing bulletin boards and grading papers," the schoolmarm acknowledged when asked why she sought the leadership post of the state's most powerful labor union. OEA's president last year had a salary of $95,859, fringe benefits of $52,504, and an expense allowance of $30,691. Christopher Klicka, senior legal counsel with the Home School Legal Defense Association, says homeschool parents should prepare once again to oppose ratification of the United Nations Convention on the Rights of the Child. There are many different reasons why educators fork over hundreds of dollars annually to belong to the Oklahoma Education Association, the state's largest school employee labor union. But certainly one of the chief reasons is to get the $1 million in civil liability coverage the union provides. "Individual NEA members have long griped about the high dues, the bureaucracy, and the aggressive political nature of their union," Bob Jones reported in the March 24 issue of World magazine. "So why do they stay? In a word: Insurance. In a litigious society, students and parents are increasingly unwilling to respect the authority of teachers. An educator who disciplines a child or gives a bad grade on a final exam can quickly find herself in the middle of an expensive, time-consuming lawsuit. The NEA touts its liability insurance as one of the prime benefits of membership, and thousands of teachers dutifully write their checks each year primarily because they want that protection." Susan Battershell did. "I joined because we were told in college that we would be very foolish, in today's society, not to have liability insurance in case a parent decided to sue us," says Mrs. Battershell, an 11-year teacher now teaching at Anadarko Middle School. Donna Smith, a two-time Altus Public Schools Teacher of the Year, was an NEA member for some 20 years. "My experience was that, with the exception of officers, most teachers joined because of the protective insurance," she says. In short, as Ringo Starr might put it, "You got to pay your dues just in case the momma sues, and you know it don't come easy." Indeed it don't. In Oklahoma, total union dues (national, state and local) are around $375 annually, and will increase this year. But how much of that dues money actually goes to pay the insurance premium? Tracey Bailey, the 1993 National Teacher of the Year, is director of special projects for the Association of American Educators, a non-union professional organization. A popular conference speaker, Mr. Bailey says he has asked hundreds of teachers what portion of their union dues they think goes towards buying insurance. "Almost without exception they'll say, 'At least half of it goes for legal and liability insurance and half of it goes for those political things -- I really don't agree with those but I need the legal and liability.'" Mr. Bailey estimates "90 to 95 percent of teachers have bought into this myth" that a good chunk of their dues goes to purchase the insurance. But according to a rate filing memorandum submitted by the Horace Mann Insurance Company and on file at the Oklahoma Insurance Department, in the upcoming school year the educators employment liability policy will cost the union no more than $4.29 for each covered teacher. Not exactly the kind of thing the union wants shouted from the housetops. Okay, so the insurance is cheap. But doesn't the union provide other benefits to its members? Sure it does, and teachers for whom those are important can perhaps justify paying hundreds of dollars a year in dues. The point is simply this: most teachers probably would be shocked to learn their insurance costs only $4.29. Those who joined the labor union solely or primarily for the insurance might want to consider an alternative, such as the nonunion Association of Professional Oklahoma Educators. Mrs. Battershell, for example, was offended by the union's left-wing politics and wanted to be a part of "a professional, not a political, organization." So she dumped the union and joined APOE after a couple of colleagues showed her APOE's dues were about half the union dues -- while the liability coverage was double. APOE also provides legal assistance, staff development workshops, and other benefits. Why are APOE's dues so much cheaper? For one thing, their overhead is considerably lower than the union's. Keep in mind, "most of the dollars deducted from teachers' paychecks are inserted into the paychecks of someone else," education writer Mike Antonucci points out. For instance, according to the OEA's 1999 tax return, president Carolyn Crowder's salary is $91,167. Add to that fringe benefits totaling $27,349 and expenses (travel, vehicle, and telephone) of $22,370. OEA executive director David DuVall's salary is $72,000; his fringe benefits total $30,396 and his expenses total $16,537. And of course it costs money to get those big-government politicians elected. "As a responsible citizen, I would prefer to make my own decisions about which candidates, issues, PACs, etc. to support with my money," Mrs. Battershell says. "And I would like my professional organization to be up front with me about the cost of liability insurance." If teachers know how cheap that insurance really is, and that they have an alternative to the union, many may choose to give themselves a pay raise right now. "Oklahoma has racked up a few charter school duds, but it's had success stories, too, particularly in Oklahoma City," the state's largest newspaper editorializes today. "A decade into the law is a good time to evaluate whether it’s too restrictive." "Public school teachers are supposed to teach kids to read, so it would be nice if their unions could master the same skill," The Wall Street Journal editorialized yesterday. In a recent letter to Senators, the National Education Association claims Washington, D.C.'s Opportunity Scholarships aren't working, ignoring a recent evaluation showing the opposite. "The DC voucher pilot program, which is set to expire this year, has been a failure," the NEA's letter fibs. "Over its five year span, the pilot program has yielded no evidence of positive impact on student achievement." That must be news to the voucher students who are reading almost a half-grade level ahead of their peers. Or to the study's earliest participants, who are 19 months ahead after three years. Parents were also more satisfied with their children's schools and more confident about their safety. Those were among the findings of the Department of Education's own Institute of Education Sciences, which used rigorous standards to measure statistically significant improvement. If you call that "failure," no wonder the program has been swimming in several times as many applications as it can accept. They come from parents desperate to give their kids a chance to get the kind of education D.C.'s notorious public schools do not provide. That's the same chance the Obamas have made by opting for private schools and Secretary of Education Arne Duncan has taken by choosing to live in a Virginia suburb with better public schools. Contrary to the NEA's letter, the D.C. voucher program isn't magically expiring of its own accord. In March, Congress voted to eliminate the vouchers after the 2009-2010 school year unless it is re-approved by the D.C. City Council and ... Congress. The program, which helps send 1,700 kids to school with $7,500 vouchers, was excised even as the stimulus is throwing billions to the nation's school districts. "Langston University received approval Friday to sponsor charter schools that will open next school year in Tulsa and Oklahoma City," the Tulsa World reports. Harding Charter Preparatory High School "is more than just a shining light in Oklahoma City's educational landscape," The Oklahoman editorializes today. "It has become a lifeline for children eager to defy their demographic odds." ... could actually hinder meaningful education reform, Lindsey Burke reports. A school resource officer in Stillwater has been arrested on charges of lewd acts with a 15-year-old junior-high-school student at the school where he worked, The Oklahoman reports. As I never tire of repeating, a recent analysis by the Associated Press found that "sexual misconduct plagues U.S. schools" and suggests that sexual misconduct among male schoolteachers is at least as common as among male priests. And a 2004 U.S. Department of Education study found that one in 10 public school students is sexually harassed or abused by a teacher or other school employee at some point between kindergarten and 12th grade. For more on school safety, I direct your attention to "Crime on Campus," a recent project of the Tulsa World. The Cherokee Nation is providing $125 vouchers to eligible public-school students in the tribe's 14-county jurisdiction. Alas, the vouchers are not for private-school tuition, but hey, it's a start. How high is teacher pay in Oklahoma? "After adjusting for cost of living, Oklahoma teachers get paid well compared to teachers in other states," Cato Institute scholar Neal McCluskey writes, "and Oklahoma teachers get remunerated roughly on par with comparable professionals on an hourly basis." "Why pay for religious schools when charters are free?" Erica Schacter Schwartz asks in today's Wall Street Journal. "Homeschooling is now a major force in American education," writes Dr. R. Albert Mohler, Jr., president of The Southern Baptist Theological Seminary and (according to Time.com) the "reigning intellectual of the evangelical movement in the U.S."
Christian parents have been in the vanguard of this movement. For many Christian parents, homeschooling represents the fulfillment of the biblical mandate for parents to teach their children. These parents deserve our respect, our support, our advocacy, and our prayers. This movement is a sign of hope on our educational horizon, and a phenomenon that can no longer be dismissed as a fringe movement. In our day, education represents a clash of worldviews. Increasingly toxic approaches to education (or what is called education) drive many schools and many school systems. In that light, the fact that so many Christian parents are taking education into their own hands is a sign of hope. As this new report [The Condition of Education 2009] makes clear, we should expect homeschooling to be a growth industry in years ahead. The Oklahoma Secondary School Activities Association has been much in the news lately, considering a proposal to bump many private schools up at least one class. One argument that's been raised is that private schools have an unfair advantage because they can practice selective admission, whereas public schools have to take all comers. Approximately 85% of local property taxes go to Oklahoma's education system. This money is in addition to approximately 3.5 billion dollars that we appropriate for common and higher ed and does not include the amounts from all other sources such as some federal grants. A report by the Oklahoma Council of Public Affairs demonstrates that Oklahoma taxpayers probably spend more than $10,000 per year for each student. Oklahoma should offer a $4,000 tax credit to those parents who choose to educate their children in the private sector where they can receive a more cost-effective education. This would empower parents with the ability to determine where their children receive an education (one of the most important choices a parent will make), and would save taxpayers thousands of dollars per student. This very practical move could allow dramatic reduction in property taxation and would take a tremendous amount of pressure off the public education system because the schools' case loads would be reduced. ... from the OU High School. 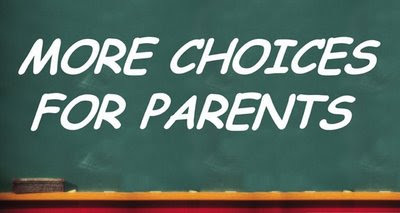 "The great moral outrage of our time is the way the public schools establishment puts its interests ahead of children, trying to kill every school choice program whatever its success," The Wall Street Journal opines today. A 'sea change' in the Southern Baptist Convention? The folks at Exodus Mandate think the SBC is getting serious about an exit strategy from public schools. Citing a recent study by the consulting firm McKinsey & Company, Thomas Friedman writes in The New York Times about "how far we have fallen behind in K-12 education and how much it is costing us." OCPA has previously pointed out that students in Oklahoma's "good" school districts (Edmond, for example) aren't doing as well as they may think. Here's a clip from a California documentary with the same message. The direction of our vapid thoughtlessness is clear; only the speed of its takeover seems now in question. K12 Inc., partnering with the White Oak School District, is now providing curriculum and school services to the new Oklahoma Virtual Academy, which will serve students across the state. In today's Journal Record, Jim Roth has a good column about Keystone Adventure School and Farm, a unique private school in Edmond where "children are learning valuable life lessons about themselves and the world around them." Lexie's Law represents an important step in providing options for parents with disadvantaged children, who are often poorly served by public schools. Florida originated private school choice for special education students with the creation of the McKay Scholarship program in 1999. Today, some 888 private schools educate more than 20,000 special-needs students through the program. These programs are truly a win for everyone. Disadvantaged students get access to the schools they need and public schools are able to stop diverting funds from general to special education. Another benefit of these programs is that disabled students who remain in public schools appear to be better-served. 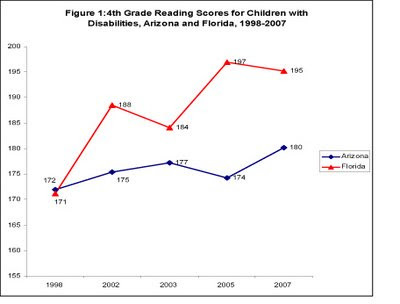 As the chart above demonstrates, since the implementation of the McKay program, Florida students with disabilities who attend public schools have made three times as much progress on fourth grade reading as similar Arizona students. The Associated Press reports that the last survivor from the Titanic, 97-year-old Millvina Dean, died yesterday -- on the 98th anniversary of the ship's launch. As it happens, I mentioned Ms. Dean one year ago today in a column in The Oklahoman in which I stressed the need to rescue children from sinking ships.